Second of a three-part series about different ways a wildcard candidate could win the presidency. Be aware that each article is intentionally written using a lot of the same wording, changing only when the particular scenario calls for it, so you can compare and contrast them easier. 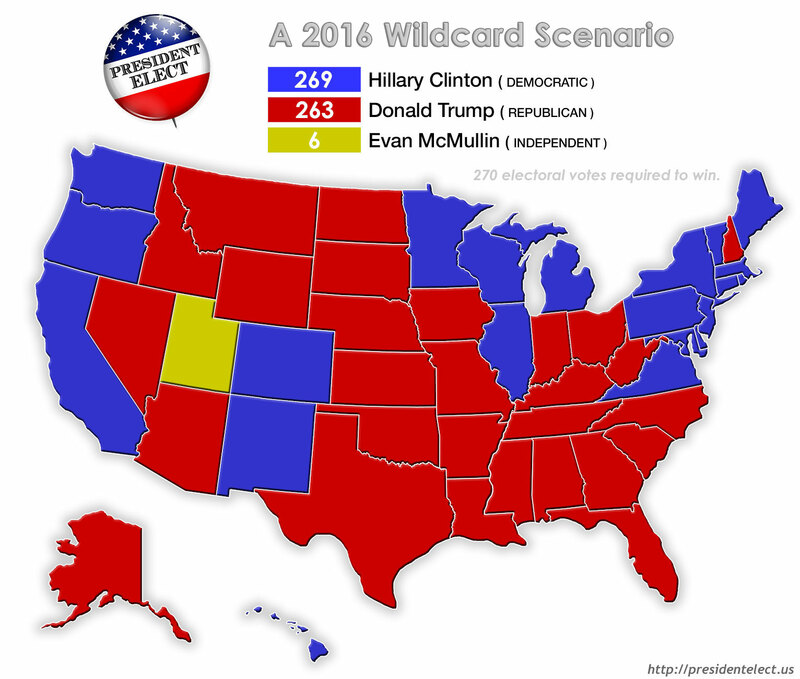 A few weeks ago, I wrote of a scenario where a wildcard candidate who isn't running could sneak into the presidency via a couple of faithless electors. That chain of events is very unlikely. However, there is an actual situation developing now that could put a wildcard candidate into the Oval Office without needing electors. While some of the maneuvering would be the same, there are some important differences. Utah is a reliably Republican state. They have voted for the party in every election since 1968, and all but one election since 1952. Since 2000, every GOP candidate has won by huge margins. But it appears their loyalty is not to the party but to their ideology. And based on recent polling a significant portion of the state doesn't believe Donald Trump shares their principles. In two different polls in the last month, Trump led by 1%, and was trailing in a third poll by 4%! That might sound like good news for the Democrats. But it is actually a conservative independent candidate named Evan McMullin who is siphoning support from the GOP. Over the past few weeks McMullin has consistently led Hillary Clinton and stayed close to Trump, even besting him in one poll. Nationwide, the race between Trump and Clinton is a nailbiter. And while McMullin may only be a serious contender in Utah, he could end up as the next President of the United States. Here's how. To win in the electoral college a candidate needs get "the greatest number of votes" and it needs to be a "majority of the whole number of electors appointed". In 2016, that number is 270. In this scenario, since no one received the requisite number of votes for president, the race is thrown to Congress to decide. But here is where it gets interesting. The 12th Amendment states that the House of Representatives chooses the president from "the persons having the highest numbers not exceeding three on the list of those voted for as president". That means they choose from between Trump, Clinton... and McMullin! That's right, a person who only won a single state could be the next President of the United States. As, for the vice president, the Senate chooses the winner of that contest. However, here the Constitution declares that only the top two electoral vote getting candidates are up for consideration. That means McMullins' running mate, Mindy Finn, is out and it will come down to Tim Kaine and Mike Pence. MONDAY, DECEMBER 19, 2016: The 538 electors from around the country meet with the other electors from their home state in a place determined by the state legislature (usually somewhere in the state capital city). There they each cast one vote for president and one vote for vice president. They all vote as expected. So it is all but impossible for Hillary Clinton to win at this stage. The Republicans basically will have to make a choice: go with Trump, the candidate that would have tied for the lead if Utah had not gone rogue, or take this opportunity to switch to a more potentially palatable conservative candidate if they believe Trump will be bad for the country and/or their party.